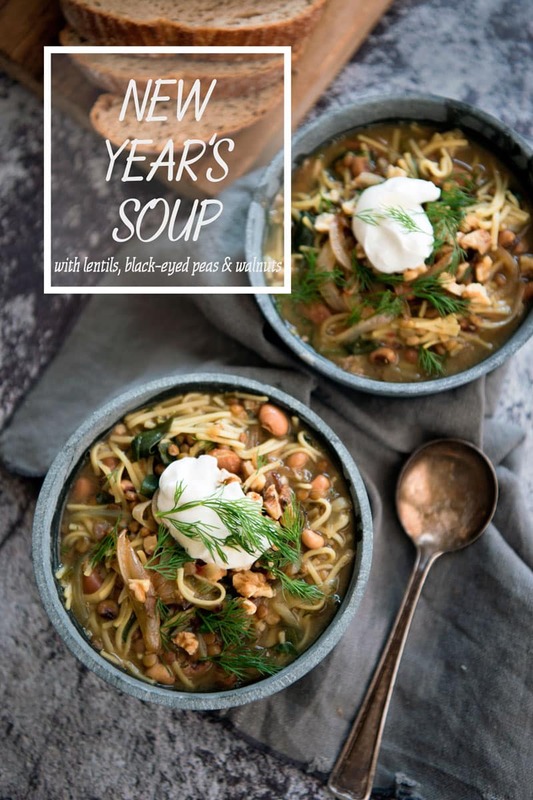 This traditional New Year’s Soup recipe with beans, lentils, and walnuts is one of my favorite soup recipes. This vegetarian soup is hearty and healthy. Editor Note: This recipe and post were originally posted December 29, 2014. This is an updated post with new photos, but the text is the same. Want to see what my photos were like two years ago this time? Check out the end of the post! Coincidentally I’m recovering from working a week of nights this year too. Happy almost-2015 friends! This year to ring in the new year I’ll be recovering from working a week of nights in the pediatric emergency department. It will be a stroke of luck if I even make it to the clock striking midnight! According to Southern tradition, a meal of black-eyed peas and greens to ring in the New Year will make the following 12 months full of prosperity. I didn’t use black-eyed peas in mine, but I’m still crossing my fingers for the best 2015. It’s definitely going to be a big year – I turn 30 (thirty! ), enter my last year of residency, and the new children’s hospital opens! The new hospital is across the city and will basically be a palace compared to the one I’m working in now. To say I’m stoked is an understatement. New Year’s resolution soup might be a better name for this recipe. It’s packed with healthy protein, greens and is low on fat. making it the perfect way to start the year. It’s one of my favorite recipes. Even though it’s new on the blog, we make it over and over, all year round. Heat the oil in a large pot over medium heat. Sauté the onion and red pepper flakes until softened, about 3 minutes. Add the spices and cook, stirring about 30 seconds. Add the stock/broth and bring to a boil. Add the lentils. Cook until just tender, about 25 minutes. In the meantime, prepare the toppings. Heat the olive oil and butter in a saucepan. Sauté the onion until golden and caramelized, about 10 minutes. Set aside. Add the beans to the stockpot and heat. Once heated, season with salt to taste. Just before serving, add the noodles and cook until al dente. Add the spinach, cilantro and dill and stir until wilted. Serve with a dollop of Greek yogurt, a sprinkling of walnuts and a spoonful of caramelized onions with lime wedges on the side. Oh, and a promised, here is one of the original photos from this post! Overall the photo isn’t terrible. 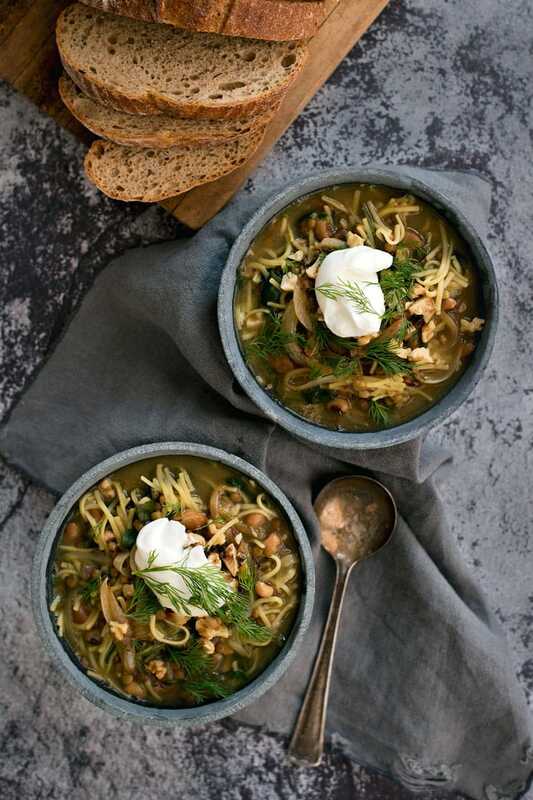 I had better control of the light in the new photos and the styling is nicer with the dill on the soup itself! I do really like the thin egg noodles in the original photo better than the extra-thin ones I had this year. What do you think? Oh, I’ve heard that before! I rarely cook with black eyed peas for no particular reason, but maybe I should incorporate them more! This looks seriously delicious. 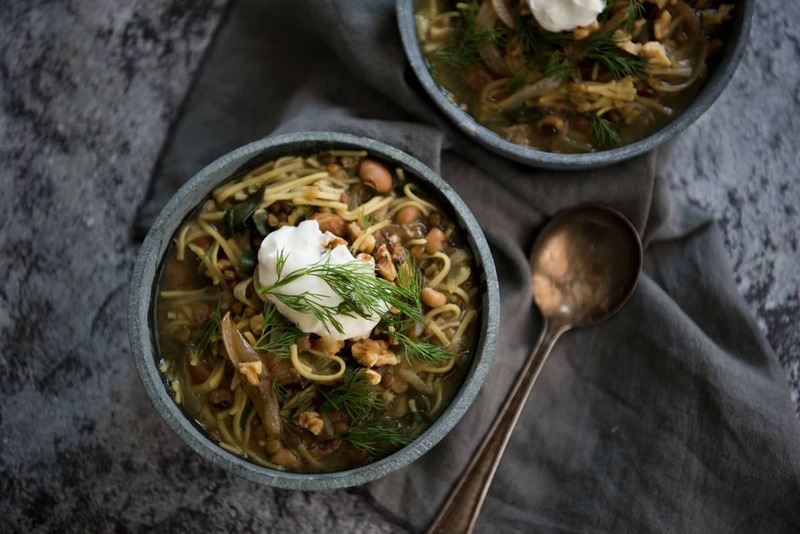 We’re big fans of lentil based soups and this is totally inspiring us to consider homemade soup for the new year! That’s great to hear! Lentils make everything better – and healthier! 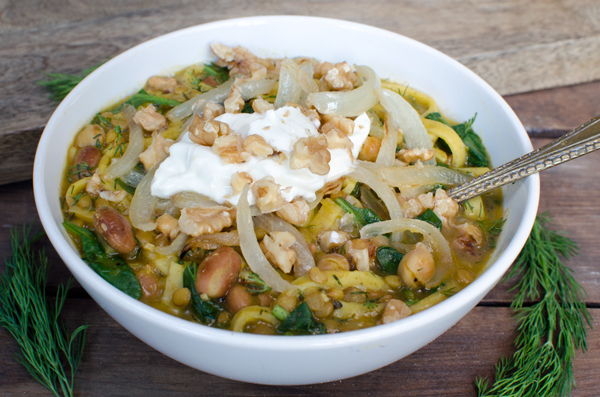 Walnuts and beans AND egg noodles? Digging on the textures!! Yes, yes and YES! I’m regretting not making a bigger batch! I hope this soup brings you all kinds of luck for the new year! Me too! 2014 was pretty wonderful and I’m excited to see what 2015 brings! Happy New Year, Kelly! this soup looks so nice and hearty, and perfect after so many indulgences over the holidays 🙂 Wishing you the best for 2015! 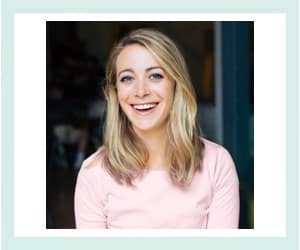 You too Christine! I hope you have a wonderful year! Love how healthy and hearty this soup is. Hopefully it brings you lots of great things for 2015! Happy Happy New Year, Kelly! Thank you Kelly! I’m so glad our virtual paths crossed in 2014! I look forward to all of your recipes in 2015! Hmm. . .I’m not a big fan of black eyed peas but I might need to reconsider because who doesn’t want a year of prosperity? The soup does look nice a hearty. . .the perfect dish for a wintry day. Happy 2015! Haha, since I made it with garbanzos, hopefully those bring the same amount of luck!? 🙂 Thanks for stopping by Lynn! What gorgeous soup!! I totally need to try it. I love black eyed peas! Thanks so much! You should – I promise it will fast become a favorite! Black eyed peas are one my favorites! This soup looks fantastic! I feel like I need to eat more! Thanks so much Jen! Mmmm this soup looks delish and perfect for a cold snowy day — you definitely don’t have those is San Fran! Thanks for commenting! When I use the word vegetarian, I typically mean not containing meat products, or I guess you could say ovo-lacto vegetarian to be more specific. For a recipe with no animal products whatsoever, I would describe it as vegan, which this recipe of course isn’t.